Fiber Optic Wall Paltes, or outlets(jacks) can be applied in FTTH access, telecommunication, CATV, data communication networks etc. They are designed to bring fiber to the desk and widely used in multi-floor and high building. 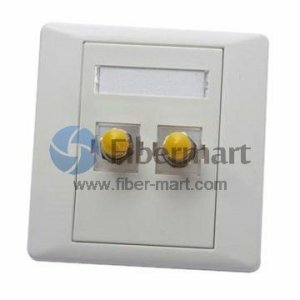 Fiber-Mart supplies different types of fiber optic wall plates, including bevel fiber wall plates with 45° adapter plug-in/out angle and hybrid fiber wall plates/outlets. These wall plates are available with LC, SC, ST, FC adapters (or hybrid with RJ45 port) and up to 4 ports. All the wall plates are with high quality and secure to any surface, drywall, baseboard, and even modular furniture.